There are over 350 million toilets in the United States including public and residential. These restroom facilities, especially in establishments, represent the company hosting them. People who use these facilities don’t always respect the public space, so it’s inevitable for mishaps to occur like standing water, debris littered on the floor, and wasted product that has to be cleaned up. Patrons don’t always clean their own messes, so finding a way to streamline the cleaning process is ideal to keeping the bathroom sanitary. The average toilet is usually colonized by microbes and sanitation has always been a concern when using public facilities. Many patrons have the option of using manual toilet seat covers which can be placed on the seat for a clean surface. The drawback is these covers are often constructed out of thin paper or plastic. They tear easily, can be knocked off the toilet seat, fall into it, or even fall to the ground. Since the patron has to handle the cover with their own hands, it eliminates the necessity of using one in the first place since the patron is going to be coming into contact any bacteria lingering on the toilet seat. Our disposable toilet seat covers don’t require the need to be handled manually to be used since our automated system takes care of the process for the patron. Once a patron is done using the facilities, the used toilet seat cover is torn off and rolled up into a plastic roll so it cannot be reused. When more wholesale disposable toilet seat covers need to be added to the system a new roll has to be placed in, the used one thrown away, and the entire process is done. How Does These Automatic Disposable Toilet Seat Covers Help Keep the Bathroom Sanitary? One crucial aspect of any public restroom is maintaining the sanitation for visiting patrons so they can use the facilities when needed. The downside is, patrons don’t always respect these public facilities often leaving trash behind or refusing to pick up after themselves. 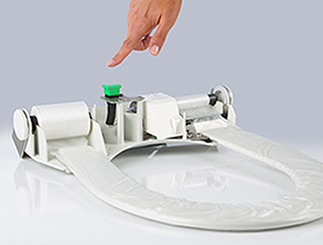 Our disposable toilet seat covers ensure they remain on the seat rather than on the floor. Cleaning personnel only have to take a few minutes at most to replace them when needed, so they’re not using up valuable time to clean resources off the floor. Investing in this automated system also means less wasted product which means saving on cleaning costs. There’s less risk of standing water on the floor being an issue if poor quality toilet seat covers aren’t being left lying around soaking up the water. One of the ideal environments for bacteria to continue thriving is in a humid environment and standing water fits the bill. Eliminating this from the start to keep the bathroom sanitized cuts down on the bacteria thriving in the bathroom and cuts down on the risk of patrons catching anything when using the facilities. Wholesale sanitary toilet seat covers is the cost effective solution for public facilities where wasted resources are a major concern. Keeping a public restroom sanitary can be a major challenge, but with our automated system you’ll find it’s easier than ever. There won’t be wasted product on the floor and you’ll be able to save on cleaning costs since you don’t have to constantly replaced wasted toilet seat covers. Many establishments have invested in our automated system and found its ideal to keep up with the daily traffic of public restrooms. Replacing the toilet seat covers is simple with just a few basic steps necessary to complete the task. When a patron goes to use the facilities they’ll always have a fresh surface and there’s little concern for cross contamination to take place. We encourage potential clients to give our system a try and see why it’s so popular among establishments.